“I had a feeling we were going anyway.” – How’s that for unwavering belief coming from Russell Wilson when asked about making it to the Super Bowl. His father used to say to him, “Why not you” and he has translated that to “Why not us”. At 5’11” he’s the shortest quarterback. When it came to getting drafted in the NFL he was overlooked by so many teams because of his height except the Seahawks. He’s constantly had to prove all the doubters that he was capable of being a successful NFL quarterback. As an entrepreneur, is that any different as we set out on our journey to launch our startup? Don’t we all have that feeling and belief of “Why not me”? There’s always going to be investors that think you can’t do it, you can’t pull it off. The way I see it, for every Goliath comes a David. As an entrepreneur, you have have to have amnesia too. “No matter how good things are going or how bad things are going, no matter what the circumstances are you just have to play one play at time”. As an entrepreneur we go up and down, many times within the same day. As a leader, you have to forget about some of the big mistakes that happen. After watching the Wilson interview when asked about his first play of fumbling the ball in the NFC Championship game, he said he didn’t even remember it until the press conference after the game. Amazing, the thing to learn there is focus and realizing that the mistake isn’t forever, it’s gone after the next play. 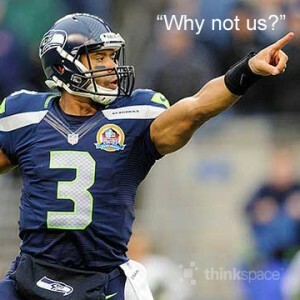 The work ethic that Russell Wilson has borders on maniacal. The no-nonsense approach that extends to every practice, every meeting, every study session. “You have to be a self-motivator in this world,” says Wilson. “That’s the number one thing that I am. I will always be the first one in and the last one to leave because I love the game”. You would never hear Russell Wilson make excuses and say “Sorry, I can’t do that — I have a life”. You think he runs around talking about “work life balance”?! That said, I bet he makes time for what is important to him. If I had to guess what that would be: It’s his faith, family, and winning the Super Bowl. You can view his interview after the NFC Championship game on the Seahawks Website. It is often easy to feel like you got the short end of the stick, to have self-doubt. When you are out of school and enter the real world and see that it is a race to be the best. I admire people that persevere regardless, for something that they feel is important. What is important is different for all of us, and despite what others say you have to stick to your guns. I admire that Russell Wilson didn’t throw in the towel, now we all get to celebrate in the Super Bowl! One thing that I kept hearing from interviews by Russell Wilson and other Seahawk players was that people kept saying they couldn’t do it and even they can’t win the Super Bowl. They kept saying back to those doubters “Stop us”. Seems like he carried his humble approach all the way through a Super Bowl win! He’s just steady and solid!